The Virtual PC 2007 has been the main free virtualization software by Microsoft for Windows users, until Windows 7, which does not support the versions up to Virtual PC 2007 SP1. Instead, Windows Virtual PC (Virtual PC 7) is released for Windows 7 systems. Windows Virtual PC is a new optional component that create and run virtual machine for application compatibility. Windows Virtual PC also powers Virtual Windows XP or Windows XP Mode (VXP or XPM) that allows older or incompatible apps, such as 16-bit programs to seamlessly run on same desktop environment of host machine without run the virtual machine. 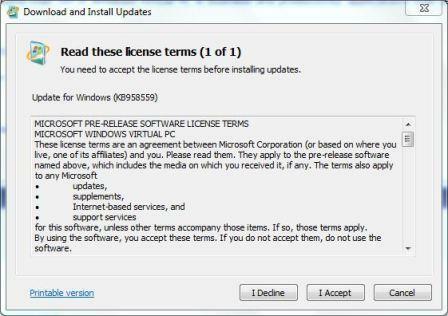 Windows Virtual PC for Windows 7 is released as an update for Windows 7, and has the Knowledge Base Article ID of KB958559. 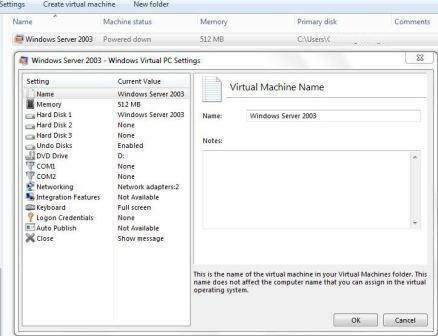 After installing KB958559 Windows Virtual PC, Windows 7 users can create virtual machine, edit settings of virtual machine, run and power off virtual machine. What’s best other than usual components integration and resources sharing, even without Virtual XP installed, it’s possible to access an application directly from the desktop of the host operating system when the application is installed in the virtual machine that runs Windows XP or Windows Vista. What’s more, Windows 7 Virtual PC now supports Windows Aero visual effect in the virtual machine. Windows 7 Professional, Enterprise or Ultimate editions, preferably 2GB of shared memory with minimum 256MB available to virtualization. Also require is processor-based virtualization support (most both Intel and AMD’s processors have hardware-VT support, but must be enabled in BIOS), similar to the Hyper-V virtualization platform present in Windows Server. Official download links for Windows Virtual PC and Windows XP Mode is now published by Microsoft. Download Virtual Windows XP Mode, which has also been leaked. After installing (or upgrading) Windows Virtual PC to Windows 7, a reboot is required. Shortcut to Virtual Machine folder and Virtual Windows XP are added to Start Menu. However, download of final version of Virtual Windows XP setup installer, VirtualWindowsXP.msi, will only start officially simultaneously with release of Windows 7 RC, scheduled on early May, from Windows Virtual PC official homepage. Note that the Virtual Machines folder opens in Windows Explorer, and Create Virtual Machine and Settings options can be found from the menu bar. Microsoft also provide Windows Virtual PC release note and Windows 7 Virtual PC Evaluation Guide document, VirtualPC_Eval_Guide.doc, which explains on how to use the Virtual PC and Virtual Windows XP in Windows 7.